Follow the recipe instructions to precook your pie crust completely. (Both homemade and store bought crusts work perfectly.) Set pie crust aside. Remove both ends of bell peppers and discard. Using your fingers, remove the seed pod on from the top of the bell peppers and discard. Slice 5 thin rings from the bell peppers to place on top of the quiche later. Dice the remaining bell peppers to be included in the next step. In a large sauté pan, heat olive oil over medium heat until shimmering. Add diced ham, onions, mushrooms, and the remainder of the red bell peppers that have been diced. Salt and pepper to taste. Allow the mix to cook until the mushrooms have released all their moisture, about 8 minutes. All the water in the pan should evaporate before filling the pie crust. Fill the precooked pie crust with the ham, pepper, and mushroom mixture, spreading it out evenly. Pour the egg mixture over the top, spreading the cheese across the top of the quiche. 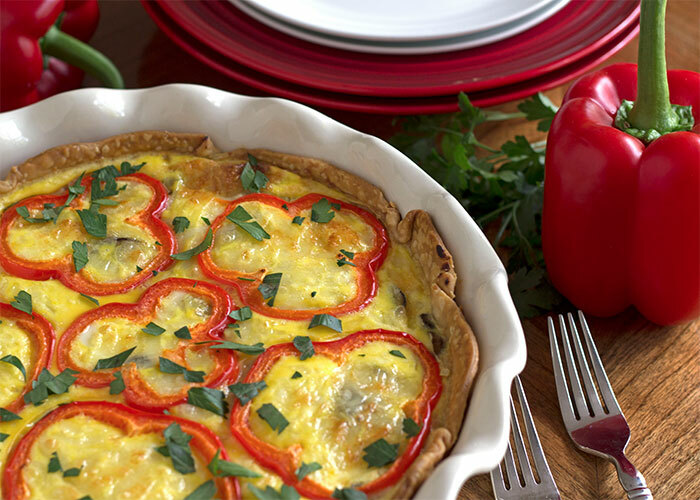 Top the quiche with bell pepper rings. Bake quiche for 30-35 minutes, or until the top is golden brown and the center is set. Let quiche rest for 5 minutes before cutting. Serve warm! And reheat the leftovers for later!